Despite a lackluster food and beverage marketplace, where growth is difficult to find, Hormel Foods Corp. management reaffirmed its commitment to its goals of achieving 5% top-line growth, 10% bottom-line growth, and achieving margins that are in the top quartile of the company’s peers by 2020 during the firm’s 2017 investor day, which was held June 15 in New York. 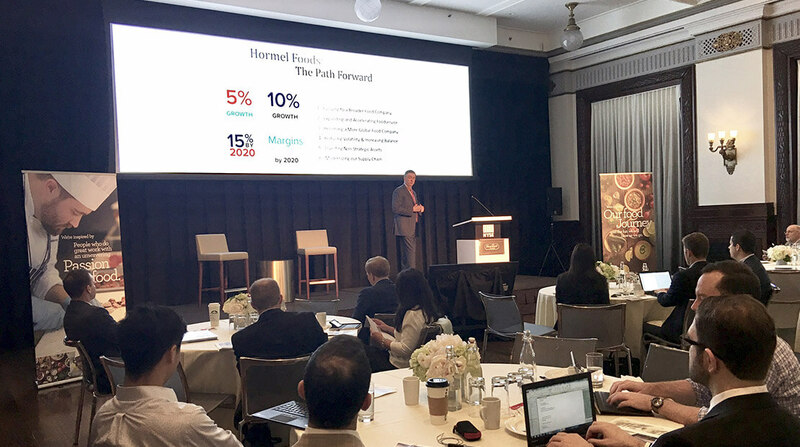 Jim Snee, president and chief executive officer, said six strategies will give Hormel Foods the momentum to achieve its goals. The six strategies include continuing to become a more diversified food company; expanding and accelerating its food service business; expanding its international footprint; reducing volatility and increasing balance throughout the business; divesting assets that do not perform; and modernizing the Hormel Foods supply chain.